Indeed? Many kudos to that ones too. They are great shaders. happy you liked the colors, they are the thing i like most also. The scene has GI+skylight(low intensity), 1 rec. light, 4 spot light, post production in after effetcs. and some brush effects in photoshop. Wow, I come back after a couple of days to hit this thing again and there are some seriously good renders up here. Here’s mine after fixing a few things and adding some atmosphere. Kye, I like the colors you used, maybe the specularity on the apple could be lowered? Some of my favorites so far have been: Holle, 3Dworks, as07. I also thought the glass versions were really well done too. Here is my second try, and maybe my final. I used about 16 lights, rendered in fprime. It’s a black and white so I tried to make it look like a real picture but without color, used a texture for the bannana and kept the color in the gray scale. Spinning lights. No Global Illumination. Hi Eomer41, thanks! I agree that the apple could be changed I might try a few more renders soon. I like what you have done with this black and white render allot! It’s very balanced and looks easy on the eye. My only small crit might be that maybe there are too many shadows? Still looks nice though! Nice work Gerardo! 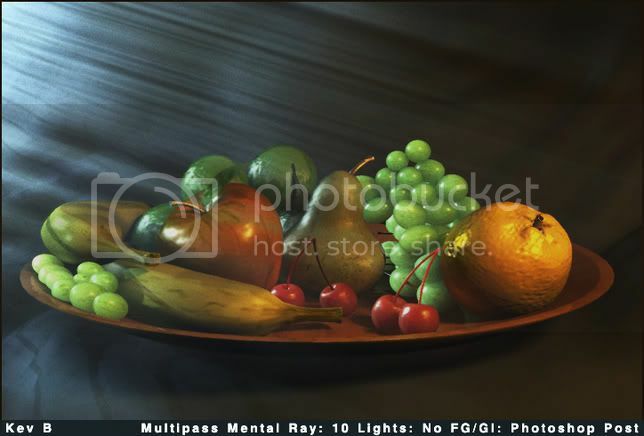 This render is really nice I especially love the grapes. Did you use SSS Shaders on them? Yes nice one gerardo. Did you use your distance to null trick to fake the sss? Heres my second one. 3 lights, no GI. Thank you Kye, I didn’t use any specialized SSS shader. As Otacon say, I used some gradients based on distance to reference objects (nulls), to fake that effect in a very faster way. I guess this technique is applicable to any 3D package. Otacon, thanks man! Your last test is nice too. What have you used for the SSS effect of your grapes? Btw, you are right. I’ve used that trick. As you know is faster than any SSS shader so far. I’ve applied also the same technique to simulate the radiance effect of the local scene and spinning lights for the distance scene lighting. Thanks. Ive also used that tecnique to fake the sss, it works good and is easy to control. My post doesn’t have much to add in terms of critiques, but I wanted to say that these are great renders here! Hats off to you guys. I noticed that most people are posting more than one version of their image. Might try a stab at another one. This all sounds like a great idea to me. i want o specialise in lighting and it would be a good way to practice. I was wonderin who would be making the scenes for people to light because i think it would be a good if it was linked with the modeling forum n people who want to specialise in modeling who could actually model scenes for us to light. I think it would be a great way for both modelers and light artists to practice. I was wonderin who would be making the scenes for people to light because i think it would be a good if it was linked with the modeling forum n people who want to specialise in modeling who could actually model scenes for us to light. 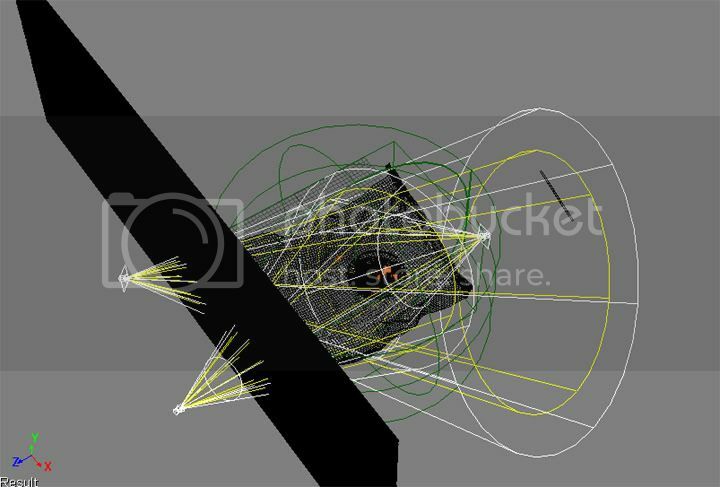 I think it would be a great way for both modelers and light artists to practice. There’s another thread about future challenges, and we definately want more scenes offered. If you want to put people together from a modeling (or texturing, rigging, or animation) forum and get them to volunteer some shots or scenes, we are interested in hearing about it. Here goes my final render. Done in blender with blender internal renderer. Textures with procedurals plus some vertex painting here and there. Illuminated with one main area light and two fill omnies, plus AO with a background map for reflections and colored light. Minimum postproduction with gimp to add a slight DOF effect (…as I see it now, I don’t know if I’ve dne it right) and also a slight tweak to balance curves. Comments and critiques are very welcome. 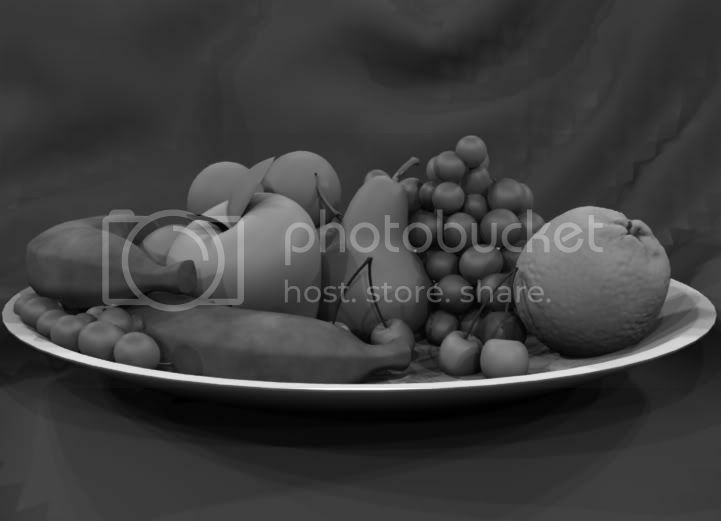 Played a bit with my first render… some shaders (grapes, pears), some more tinkering with lights. Also, added some falloff/gradient based rims - this stuff is really useful. This is my final image. As I didn’t get good results with external postprocessing, I did it with Blender itself. So, same settings as before post, but not postprocessing but color correcting done with blender. Coments and critiques are very welcome.